Triumph Motorcycles will most likely introduce the Scrambler 1200 along with the Speed Twin in India on 24 April. 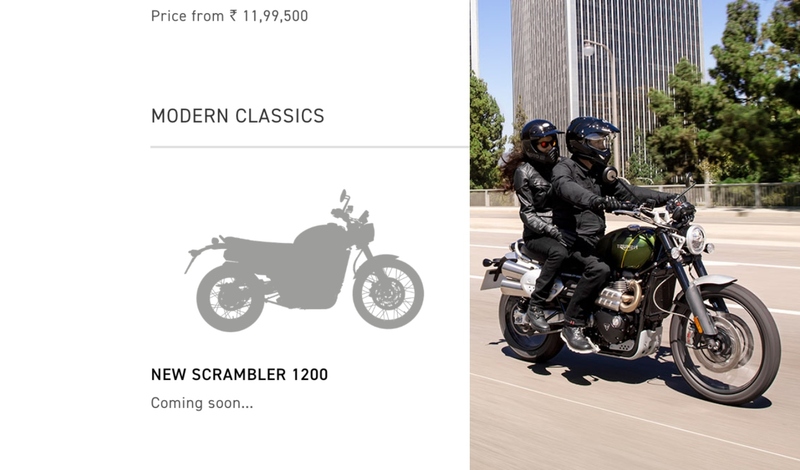 The Scrambler 1200 has been listed as "Coming Soon" on the Indian website. Triumph Motorcycles has listed the Scrambler 1200 on the Indian website as "coming soon", and we expect it to arrive along with the Speed Twin on 24 April. Internationally, the Triumph Scrambler 1200 comes in two variants – XC (base) and XE (top). The Indian market is expected to receive the XC version, and the premium variant may be launched later if there is enough demand. The motorcycle features wire-spoke wheels instead of alloys on the road-focused Speed Twin. At the front, there's a 21-inch wheel that gives the Scrambler model better off-road prowess over the standard model. The motorcycle gets a cross-spoke design that enables the installation of tubeless tyres. The Scrambler badge also brings long-travel suspension to the motorcycle. At the front, there are 45 mm Showa upside-down forks, and at the rear, there are Öhlins twin-spring piggyback shocks – both featuring 200 mm travel. Both units are fully adjustable. Anchoring department includes twin 320 mm Brembo discs with Brembo M50 4-piston radial monobloc callipers at the front and single 255 mm disc with Brembo 2-piston floating calliper at the back. Other scrambler traits include a bash plate and tall set exhaust pipes. Ride related data is displayed on a 2nd generation TFT screen that shows speedometer, trip computer, tachometer, gear position indicator, fuel gauge, service indicator, clock and rider modes. Other features include all-LED lighting, keyless ignition system, cruise control and USB charging socket as standard. Optional extras include Bluetooth connectivity module with integrated GoPro control system, ‘turn-by-turn’ navigation (powered by Google) and controls for phone and music operation. Tyre Pressure Monitoring System (TPMS) and heated grips are also part of the accessories for the XC variant. Engine specifications include a 1,200 cc, liquid-cooled, 8-valve, SOHC, 270° crank angle parallel-twin unit that delivers 89 hp at 7,400 rpm and 110 Nm at 3,950 rpm. This engine is married to a six-speed transmission. The XC variant comes with five riding modes – Rain, Road, Sport, Off­road, Rider-Customizable and an exclusive Off-road Pro. Safety net includes switchable ABS and Traction Control.